​For me the Coastal Classic was “the” race of 2015 for me. It was to (hopefully) be my 6FT qualifier having made the decision to attempt my first ultra distance race in 2016. In order to qualify I had to finish the 29k race within 4:15. This was going to be my longest run to date having only ran 22k races so far. What’s another 9k between friends though. 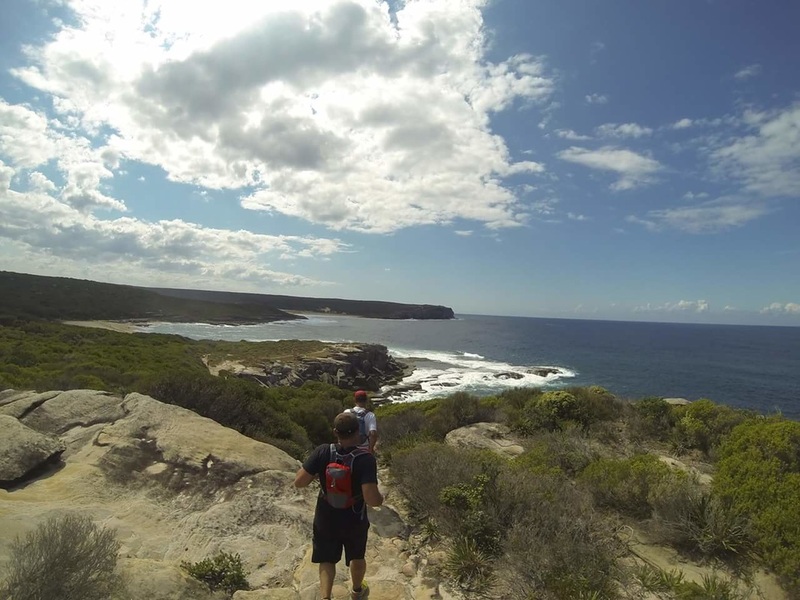 The coastal track if you don’t know it is a one way 29k track that follows the coast line of Sydney’s Royal National Park starting in Otford and finishing in Bundeena. 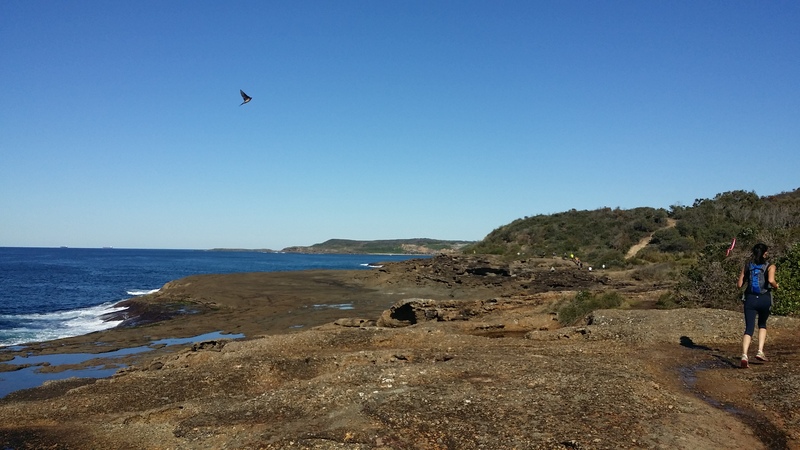 It’s a very popular multiday walk and the numerous beaches along the way are also very popular throughout the year. Ah so many beaches, so pretty to visit, not so pretty to run across! Logistically being a one way race it’s a bit tougher to organise but with the help of my lovely wife I was dropped off at the start line at early o’clock. And before we knew it we were off. 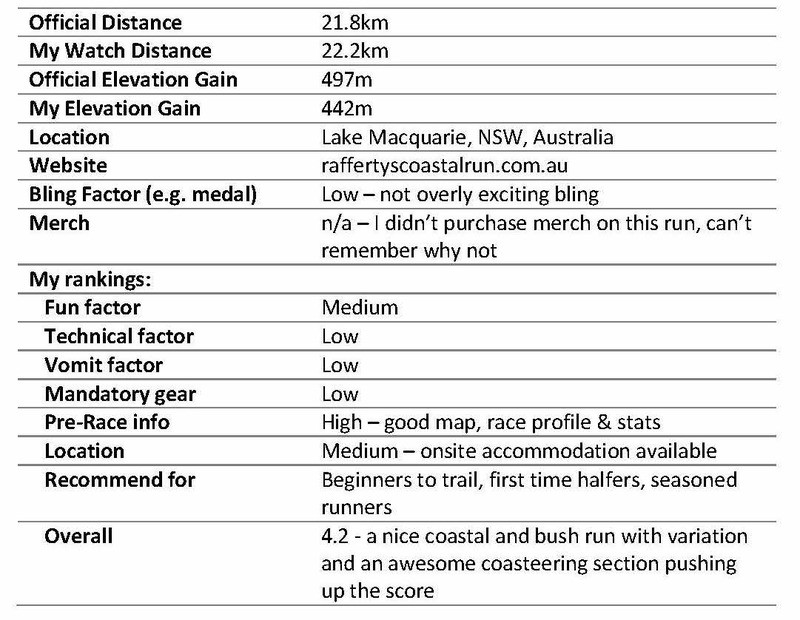 Now I’m pretty good when it comes to pre-planning and knowing what I’m in for before I get into a race but having never been out to the coast before I was quite unprepared for what was to come. The first hill of the course comes very quickly and it’s a very steep climb this made me think that the rest of the hills were insignificant. BIG mistake! ​But before all the other hills there is the most fun section of the entire course, a steep technical downhill that winds through trees and ferns. It’s a great little section but before you know it you’re on the climb out and luckily for us bright blue skies and sunshine greeted us as we emerged from the forest. ​The first section (and few later on) is on a metal grate like platform track, fine in the sunshine but not sure what it would be like on a rainy day. Also some of the squares are looser than others giving them a spring, it’s a bit like hitting a trampoline every 5th step! Fun but heart jittering at the same time! The views soon open up and the reality of what was ahead was upon me… Oh the hills. ​It was a pretty hot and sunny day and the course offers no protection once you’re out the forest. It was making the hills even tougher than normal. And I was seriously feeling it. The please come rescue me face! The race starts with a couple of kms winding through and eventually out of the resort. There’s a decent wee road climb right at the start to get the legs warmed up and the lungs working. Then it’s some wide single trail and a bit of fire-ish tracks weaving through the bush making your way out to the coast. So full disclosure time, I am writing this a good 6 months after doing the run, see I only decided to start my blog as a bit of New Year’s thing in 2016. And if I’m honest, I’m really struggling to recall what the race was like for the most part running up to the coast. But don’t worry I will be returning to the Rafferty’s trails in 2016 to compete in the 35km run as part of the Triple Challenge 2016. So I’ll do a much more comprehensive report then. But I’m going out on a limb to say that it there wasn’t much excitement or tough times leading up to the coast hence why I’m struggling to recall much of the run! But there’s one part you’d be hard pushed to forget and that’s the second you start you climb down to the water. Scaling down a rocky cliff takes you to the water’s edge where there’s a serious looking race official making sure you’re not bounding down out of control and straight into the sea. 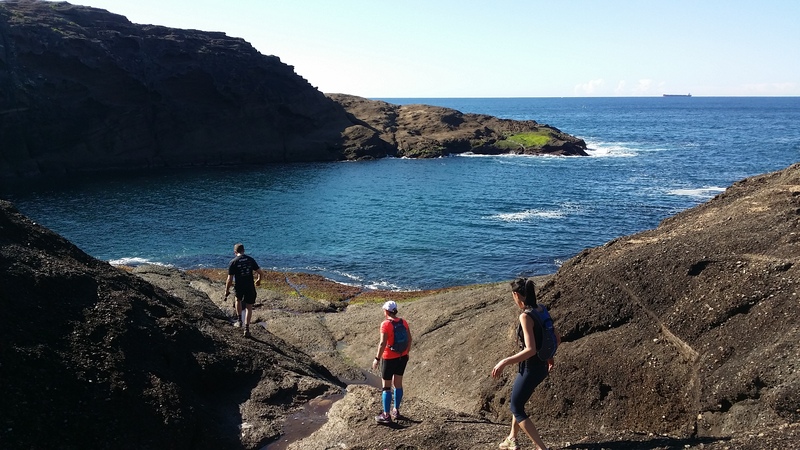 As an FYI for any keen adventure racers, there’s a Paddy Pallin adventure race out here (Cam’s Wharf) that makes you swim across the inlet here as part of the coasteering leg of the race. I 100% recommend this adventure race to anyone who’s interested, it’s sooooooooo much fun! Remains my favourite adventure race to date! Oh and reminds me to check out the 2016 dates as it’s usually early in the year. Once you’ve clambered down to the coast there’s a lovely c1km run along the rocky coast and it’s beautiful. Nobody but the runners and a few fishermen and the sea breeze in your face, heavenly! But at this point you’re only 12kms in and there’s 10km more to go so it’s time to get the game face back on as you start a decent climb back into the bush and head for the finish line. A nice thing about this course is that there’s no back tracking, it’s a figure of 8 style course with minimal cross over. The finish line approach is from the other side of the resort which is nice as there’s not as much running around the chalets. There’s a bit of a straight before the finish so the Mrs was able to snap some pictures of me coming across the line. All and all a fun run, not too tough due to the limited elevation gain. I finished in 2:21:47 and placed 74th out of 223. Again a significant improvement in my placings getting me into the top third finishers. I think that’s more to do with the openness of the race to first timers due to the lack of technicality. 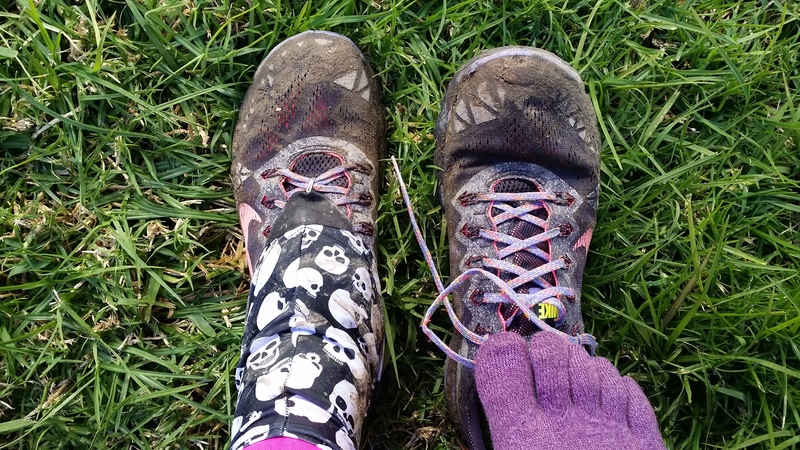 On the gear side, this was the first time I ran a race in my DirtyGal Gaiters! They ROCK! Literally (see my skulls & crossbones design a nod to my inner goth!). They kept all the grit and sand out my shoes but my feet didn’t get too hot either. They’re really easy to get on and off but do require gluing Velcro to your runners. This wasn’t an issue for me and I prefer this to the idea of the straps under the shoes as I can’t see how they don’t get caught / wear through and snap! Also they come in so many cool colours and themes. 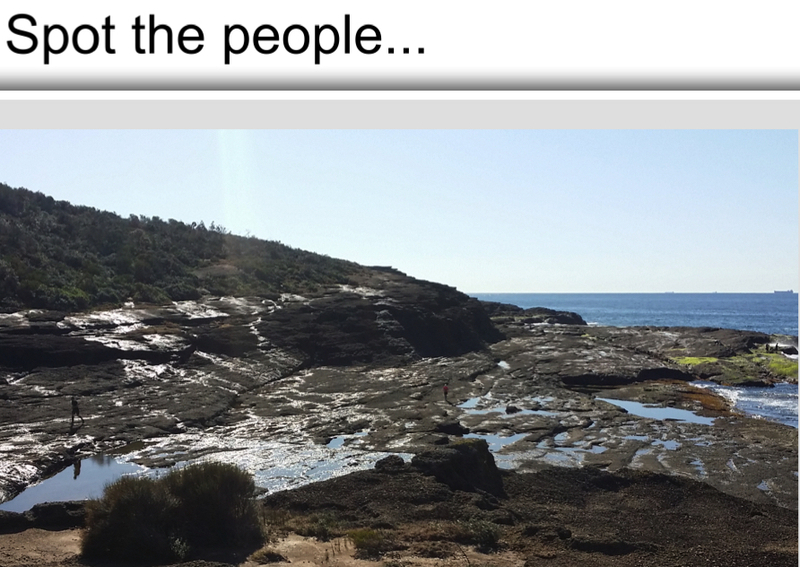 I got mine from a local shop in Sydney - https://www.trekandtravel.com.au I recommend trail runners (and road runners) to shop locally where they can, it’s important to support the small businesses that specialise in the less mainstream sports. You can get some great advice from these shops and that’s often worth more than a 10-15% saving on the cost of the item. I’ll do a post soon on some of my other recommendations for both gear and shopping locally. 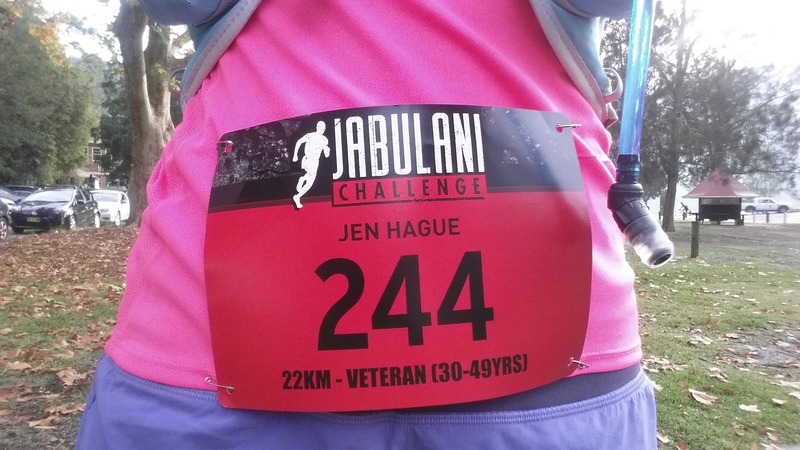 Shortly after completing the Jabulani 22km course in late April, I received an email saying that there were a limited number of spaces reserved for the Coastal Classic for runners who had completed the Jabulani Challenge. 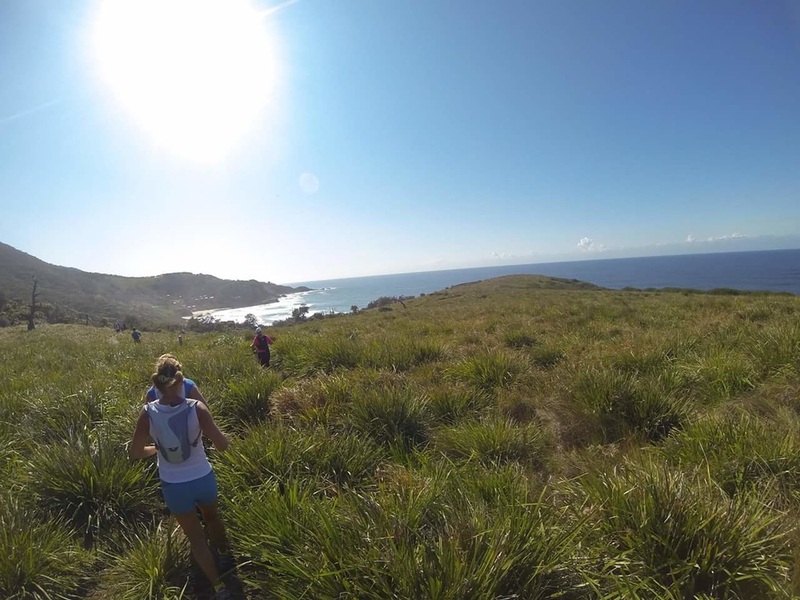 This was part of the Triple Challenge – Jabulani (22km or 45km), Rafferty’s Coastal Run (22km or 35km) and finishing with the pièce de résistance of shorter distance Sydney trail running – the Coastal Classic. New to the scene I hadn’t heard of any of these races. I’d obviously completely forgotten the battle I’d had at Jabulani (trail running appears to be like getting a tattoo or giving birth – hurts like #$%@ at the time but keeps you coming back for more!) and I signed myself up! But before I could worry about what I’d gotten myself into with the upcoming Triple Challenge, I had to get through my next adventure: the Glow Worm Half Marathon! 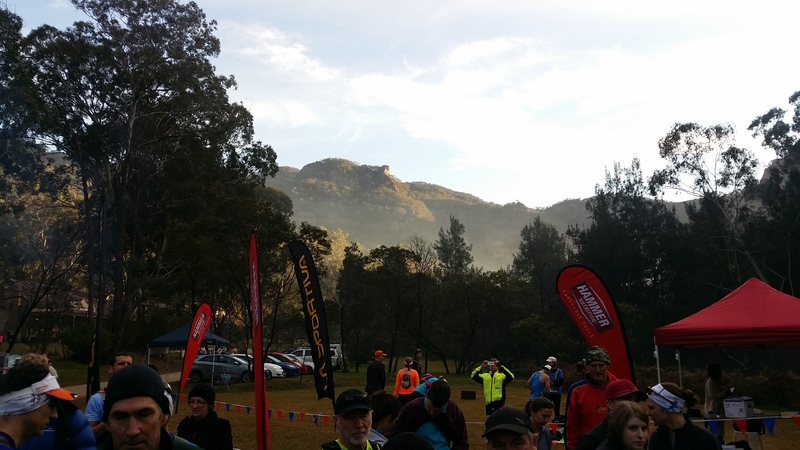 The race is based out of Newnes in the Blue Mountains (about a 40min drive from Lithgow – the last section of which is on an unsealed road so can be a bit slower depending on your car). There is the option to camp overnight (if you get in early I believe there are a few cabins). Arriving there at 7am for registration I could see my breath and as someone who likes to have a good night’s sleep before a race camping wasn’t overly appealing to me! However, seeing it in person it looks like a fun time if there’s a few of you going together. I’m a solo racer and have only just started to run with groups (another blog to follow on those!) so for me a comfy warm bed in a Stayz apartment in Lithgow was good enough for me, plus that way the Mrs is happy to come along and keep me company after the race. Because they’ve set up a campsite it means there are lots of toilets but it also means limited parking at the start line if you’re late. I secured one of few remaining around the camping area and other cars were then directed further along the road to a secondary car park. Looked like it wouldn’t have been more than a 5 minute walk. 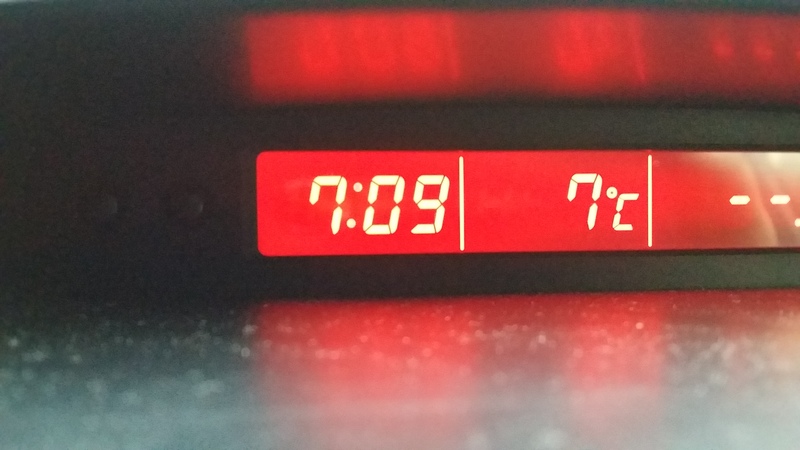 As I said, it was cold! This was the first race I’d ran in winter and I was glad of my full length 2XUs and my long-sleeve thin thermal from North Face. (Note to self to buy a couple more of these, they were great for running in!). Also in the mandatory gear was a buff / hat and gloves. Both of which I started in but shortly got rid of as I ultimately warmed up – 22kms of trail will do that to you! 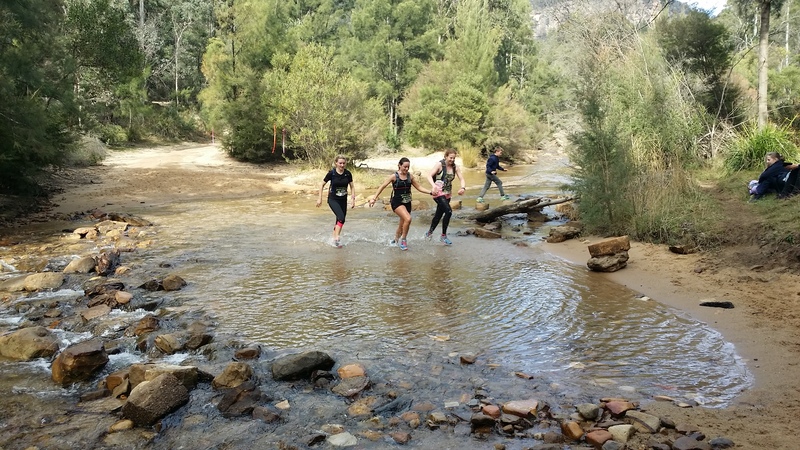 The race starts with a creek crossing about 300m from the start line! There are stepping stones which very quickly bottle necked. Learning from previous runs I’d positioned myself a bit closer to the front of the pack in the line-up so when I hit the creek the bottle neck hadn’t really started and I could have taken the stones after a short wait but hey we’re here to run because it’s not the road and I got caught up in the spirit and after a 2 second pause I chose to run straight up the guts of the river! Now some words on my running gear – I run in toe socks specifically Injinji Mid Weight Trail Socks. These are fantastic when your feet get wet. In fact I couldn’t really tell I had wet feet – probably because your toes aren’t rubbing together so you don’t get the wet skin on wet skin feeling. I couldn’t recommend these socks more! From event photos later on though the bottle necking wasn’t just limited to the stones, there seemed to be a line of runners (or standers!) assessing their options as one or two waded through the water and others queued for the stones. In my opinion, and based on my awesome socks, I’m really happy I made the call to sprint to the creek and run right through it. The water at the time was somewhere between calf and knee. Once you make it through the creek it’s up, and up, and up, to the Glow Worm Tunnel. 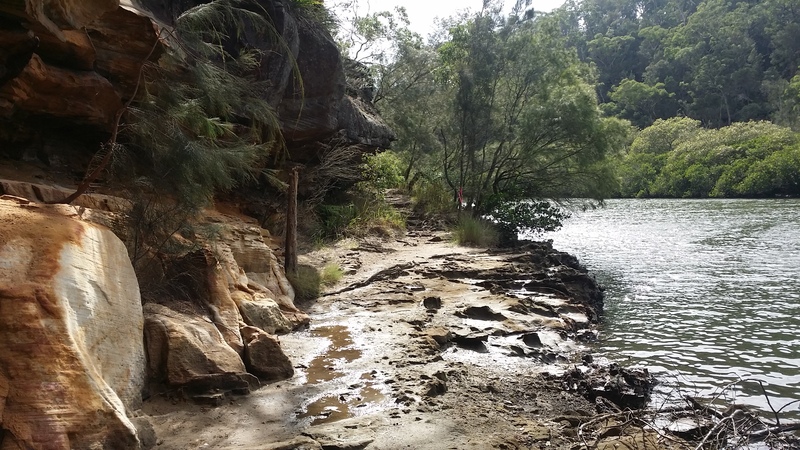 The first 12kms are mostly uphill and take you through decent wide trails, some sections of passable single trail and some rocky creek crossings. After a particularly tough climbing section (there are some!) where I was feeling a bit over it I passed by some kids and their dads who had hiked out on the course to cheer on runners (probably waiting for their loved ones to run by) but their cheers, words of encouragement and the high fives from the kids boosted my mood significantly and I was once again in my happy place. I can’t emphasise enough how much a cheery volunteer or spectator can boost my moods. Their dedication to be out there making the events possible and cheering on people they don’t know should be applauded. I always try to thank them for being there, sometimes all I can manage is a feeble wave but I hope it’s enough to show my gratitude. On the bucket list is to make sure I get myself to a volunteering station. That’ll be one of my running goals for 2016! Then as you near the tunnel the landscape transforms into beautiful rainforest. The lush green surroundings are a contrast to the drier Australian bush on the approach. I tried to capture some of the beauty but failed too much excitement caused camera shake! The tunnel itself is an old railway tunnel (you’ll see old rails on the route up to the opening) and is about 400m long. As you enter it’s time to stop, turn on your torch / headlamp and slowly make your way through. This race isn’t one for the ultra-competitive – you must walk through this section and if you want to see glow worms keep the noise down! Also in order to see the glow worms you need to turn your light off and stand still. I was lucky to be surrounded by runners with an equal appreciation and we did this and spotted a few clumps of glow worms on the roof. But other not so conscientious runners came bounding along shining their lights so they soon disappeared. So with that I continued the precarious walk through the tunnel – the ground is really uneven and very wet and slippy in parts so be careful, there is after all another 10kms to go once you surface!! The other glow worms - runners! It’s a short climb out of the rainforest and back on to the way you came up. I actually didn’t realise that the course was an out and back (with a decent loop around the tunnel) until I was back at the creek crossing 300m from the finish line!! Doh! That’s what I love about the trail – run the same route 3 times in a row and you’ll only recognise a handful of sections. There’s a new way to see the trails each time you go. Me and Mrs run the same trail most Sundays and every time it looks and feels different and I’m always surprised at how quickly we’ve hit a waypoint. The finish at the Glow Worm is nice, a splash through the creek and then a short road climb round to the finish gates where the announcer dutifully calls your name out and the crowds cheer like you’re not the 25th person they’ve just watched come through! Again what I love about the trails – the camaraderie! Both at the finish but mostly throughout the event. The last 3kms of this course I buddied up with a runner from Canberra (can’t remember her name) and we crossed the finish line together thanking each other for the last push through the gates – I tried to hang back because her BF was taking photos of her and I didn’t want to get in the way and she said no way, I’d helped her keep going in that last 3kms and deserved to finish with her! See – such a great community! As you can see from the race profile it’s a big climb up and then a shorter run down but overall the elevation gain is a mere 664m (according to my Strava – loaded from my Nike+ account, I was a Nike watch holder earlier in my running adventures). Now 664m might sound like a lot to some but in comparison to say the similar distanced Hounslow Classic (a new event for 2015, see my later post) which clocked an impressive 1,996m, the Glow Worm Half is a walk in the park! And to be honest it did feel like that. I finished in 2:29:10 and was 159 out of 415 – my best result to date! I’d highly recommend this run to new and seasoned trail runners. It’s definitely one that I’ll have on my list each year. For 2016 I’m considering the marathon which has a tough first section but then tags on the half marathon for the second part of the course (though usually run on separate days). But if I don’t I’ll definitely come back for the half. Bloody hard is the answer!! This was the race that almost broke me. The first 5km took over 45min. That’s just 10min away from my 10km road race pace!! Knowing that seriously messed with my head. The start of the course has a gruelling climb out of the valley, there was some serious bottle necking on the single track at the start. As my self-doubting self does, I had placed myself quite far back in the pack at the start line – something I’ve learned not to do now. If you usually place in the top 50% of participants, then start at about halfway in the line-up. Don’t feel bad politely working your way through to where you think you should start. Most trail runners would prefer you nudge past them at this point than when you’re hot on their heels on a single track huffing to get past. Once you’re on those single trails your stuck there until there’s a wide enough place to pass – remember it’s not a road race, there are no “rules” but there’s a trail running etiquette that you’re best to familiarise yourself with. 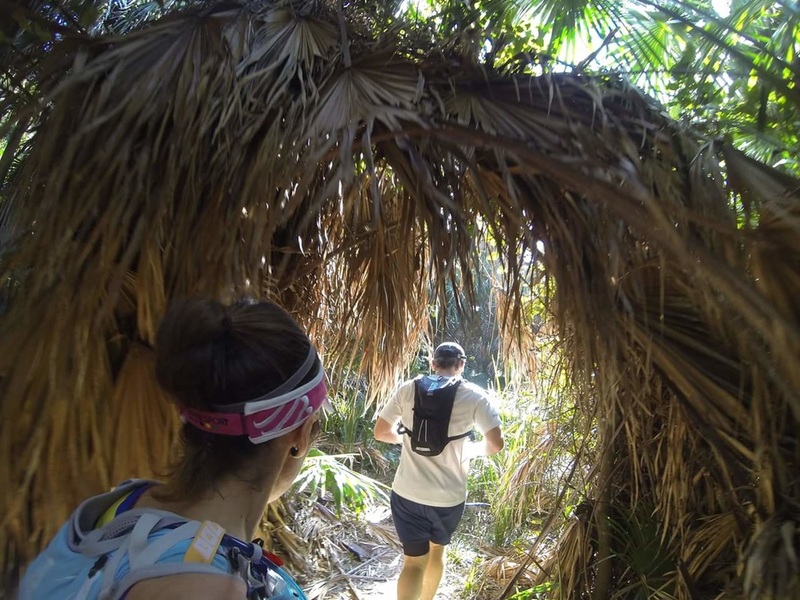 Remember trail running tends to attract characters – whilst a road runner might give you a dirty look if you hustle them on the course, a trail runner will give you an earful about respect and etiquette! So back to Jabulani… The first 5km as I said were basically hell. Slowed down significantly on the initial single track I then paced it out on the short flats as much as I could along the Gibberagong Track, rising from 11m to 152m in the first 5kms (undulation would make this a bigger overall gain). So by the end of the first 5km I was exhausted. In training I certainly hadn’t put in the hill work (I don't even know what they mean by hill work!) and was feeling the burn in my legs. 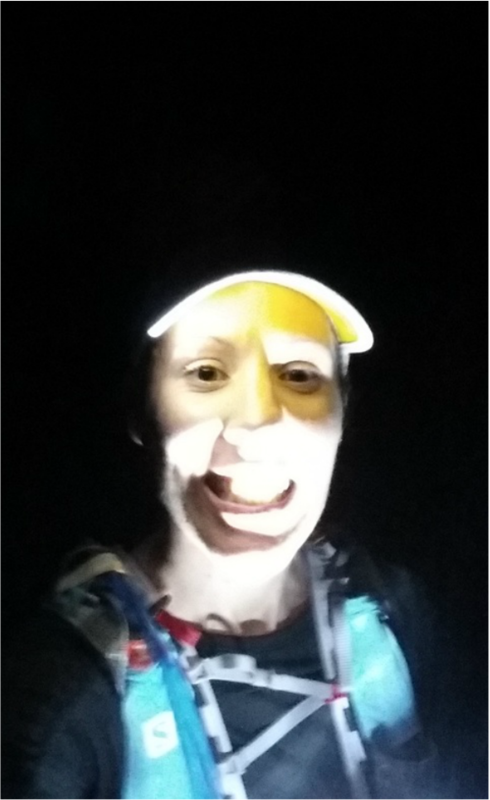 I spent a good half hour of this time thinking about an escape plan – feigning injury at the next aid station, sneaking off into the bush and putting in a pull out call to the organisers. But alas I didn’t. I picked my feet up one after the other and continued on, grumpily but faking manic smiles for the selfies!! "You are having fun! You are having fun!!!" Is this the same hill or another hill, who knows. But I know it hurt! ​With the hell of the hill behind me I started again to enjoy the run a bit more. There were some beautiful sections near the water and some great views of the National Park from the climb. But I was too buggered to really enjoy them. Yay this is why I really do love the trails. So pretty. ​It's not a run that I’ll chalk down as “fun”. 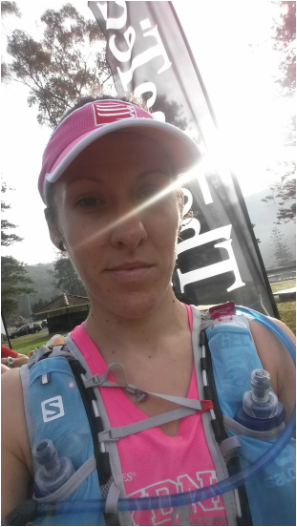 I was too tired, I don't really know what to do with my nutrition yet relying only on a couple of Gu gels and not realising that the course was significantly harder than Manly Dam and hence more exertion would mean more calories needed to keep my energy up.